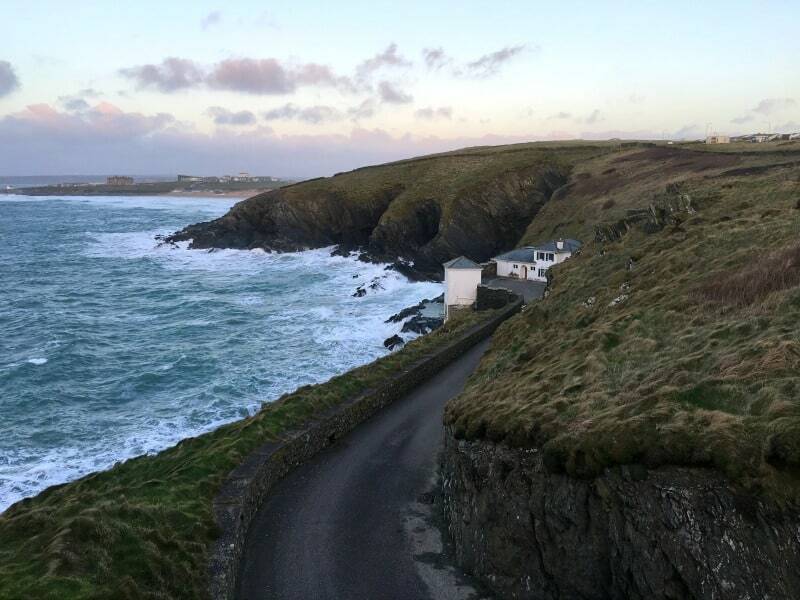 If you want breathtaking views and an exceptional dining experience I strongly recommend that you book a table at Lewinnick Lodge during your next Cornwall holiday. 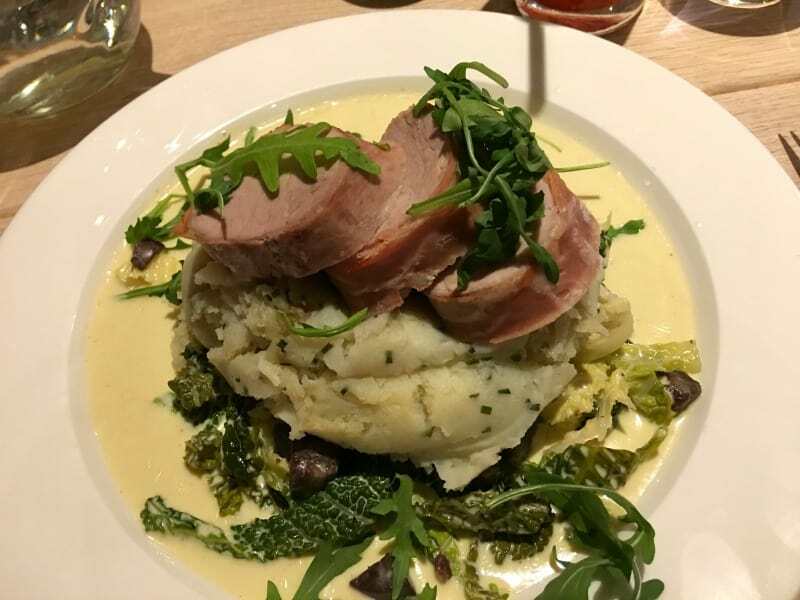 As restaurants in Newquay goes it’s probably one of the best and will tick all the right boxes if you want a special treat or have an occasion to celebrate during your trip. That’s a pretty bold opening statement but that’s how impressed we were with both the food and the location of this restaurant and luxury bed and breakfast in Newquay. I strongly recommend that you pay it a visit too so let me tell you why. We were lucky enough to arrive at the restaurant in daylight, and I’m so glad we did as the views are just stunning. Someone had told me prior to our visit that it was like being on top of the world and they were absolutely right. The first thing you do when you arrive at Lewinnick Lodge is head to the garden to watch the Atlantic Ocean crashing up against the cliffs and the rocks below. The garden is enclosed by a glass barrier so you can fully enjoy the experience of the sea, no matter how tall you are. The only problem you are going to have is tearing yourself away to get to your table in time for your reservation, but trust me when I say it will be with it and that the food will not disappoint. Lewinnick Lodge is an independently owned business and all the produce is locally sourced where possible so you know that you are getting a truly authentic Cornish experience. We buy all of our fish from Matthew Stevens and Son of St Ives and quality meat from Two Brothers and M. Yates & Sons. We buy fresh vegetables from our local greengrocer Westcountry Fruit Sales & Total Produce. Rodda’s supply all of our dairy products and we use the best Cornish ice cream. Our bread comes from Baker Tom, Newquay. For those special menu items we use Forest Produce and Celtic Fish and Game. All of our poultry is free range. The menu is well crafted and we were also impressed with the specials that were available which allowed for my husband to indulge himself in his love of all things curry. 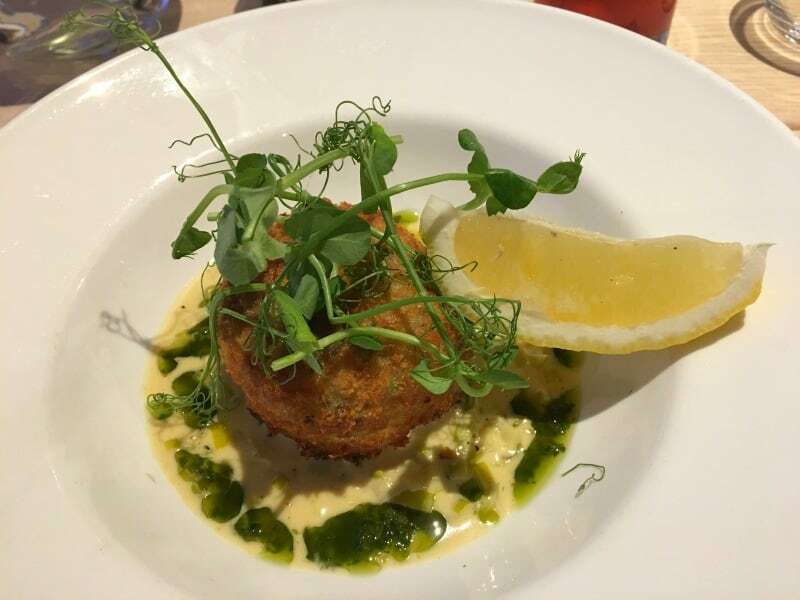 He ordered the onion bhaji for starter, which I have to admit is one of my favourite dishes but I was keen to try the Lewinnick fishcake with creamed leeks, lemon & pesto. I thought I had tried some fairly good onion bhaji, but this one from Lewinnick Lodge was exceptional. It was presented beautifully, and it was so crisp and tasty that I got hit with a strong case of food envy. The chef had got this dish perfectly right and I would say it was a great starter whether you are a curry lover or not. The Lewinnick fishcake with creamed leeks, lemon & pesto certainly had a lot to live up to, and it was delicious and exceptionally delicate. 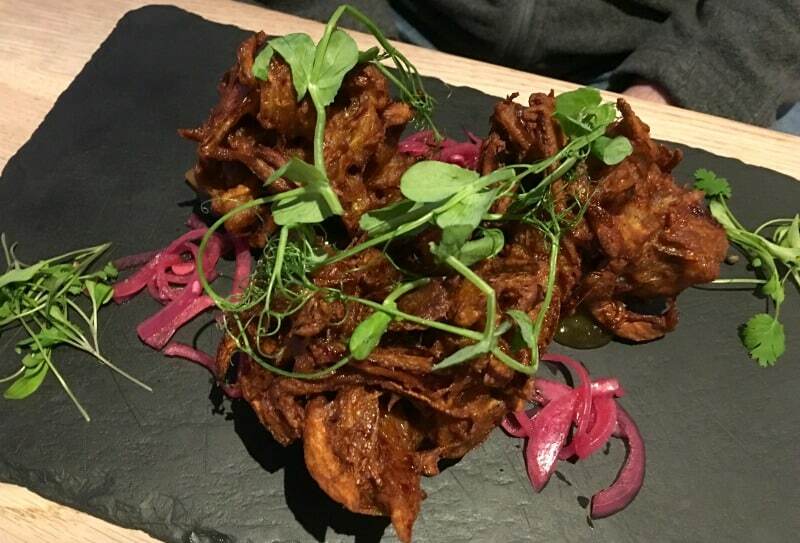 It was a beautiful starter and I would happily have it again, but the onion bhaji just pipped it to the post as everyone’s favourite. 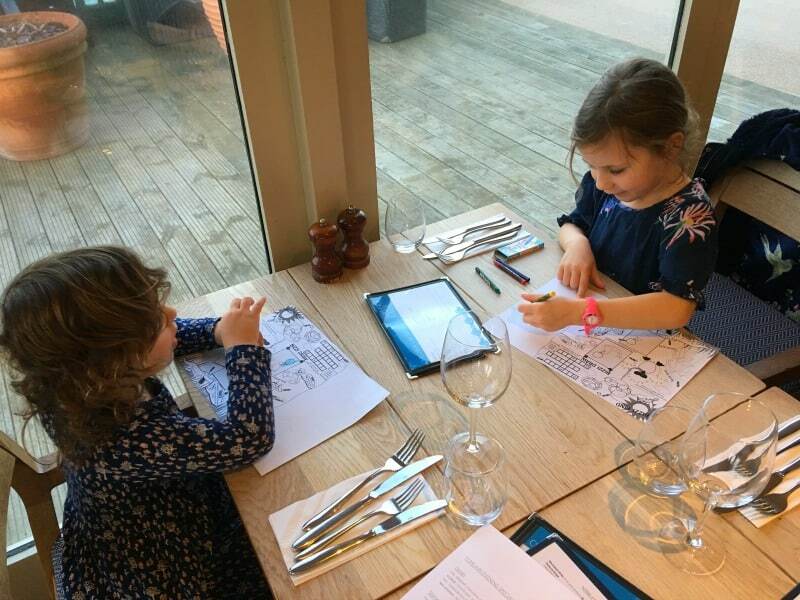 It was great to see a three course menu available for the children, and they started off by tucking into the garlic bread while colouring in their latest pictures. The sausage and mash was the obvious choice for their main, and two good sized portions arrived at the table for them. They probably could have shared one dish to be honest but sometimes sisters just don’t want to share, if you know what I mean. The mains definitely didn’t disappoint either myself or my husband and I went for a truly comforting dish from the specials menu. The pork fillet in parma ham was delicious. I was slightly worried about the black pudding featured in the dish, but actually it worked perfectly with the rest of the flavours. Daddy looked a bit perplexed when his Thai style cod en papillotte arrived as I don’t think he realised it was going to be served in paper. He soon got the hang of it though and was happily tucking in before to long. A clean plate on the other side of the table spoke absolute volumes and I’m pleased to say Daddy was enjoying eating at Lewinnick Lodge as much as me. Somehow everyone still had a little room for dessert, and it was time for the girls to see if the waiter could cope with their very specific ice cream demands. I’m pleased to say he did a very good job and they were very happy indeed when their scoops arrived. The rhubarb fool was a big hit on Daddy’s side of the table and my ginger treacle pudding was a (not so) little slice of heaven. 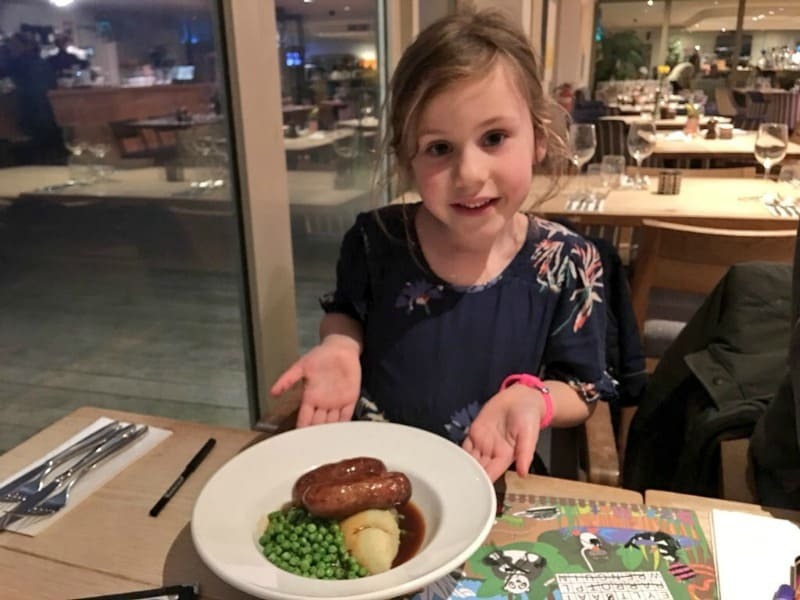 As well as enjoying amazing food we were throughly looked after while dining at Lewinnick Lodge which made for a an exceptional experience for eating out as a family. 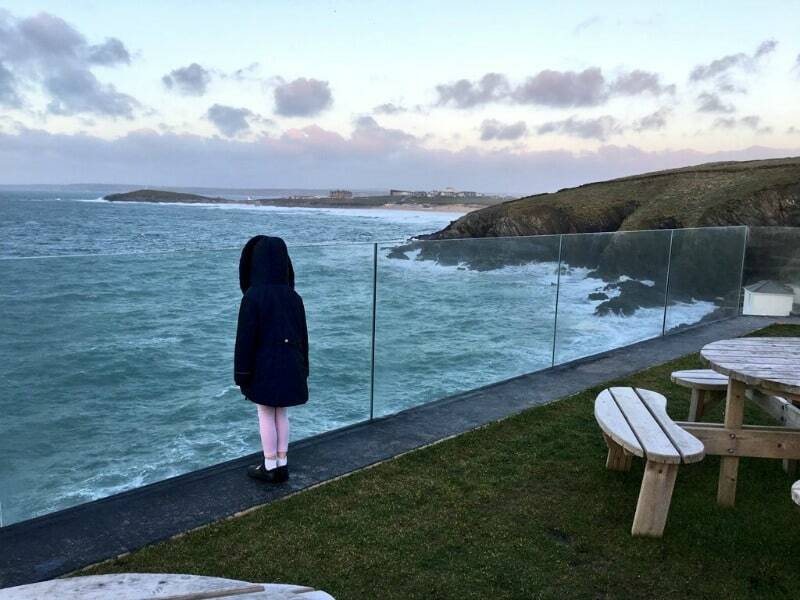 If you are looking for restaurants in Newquay I strongly recommend that you add Lewinnick Lodge to your list of places to eat, as it certainly ticked a lot of boxes for us. We were provided with a complimentary family meal at Lewinnick Lodge in return for our honest review but all thoughts and opinions are our own.